Taeshi is a boss, she can draw for like 20 hours straight, and she ain't afraid to show her love for pokemon. During the stream, the topic of my pixel-art obsession came up, and souppy was falling asleep, so Taeshi told us to ask questions. I asked, of all the old school games, what pixel art style from a video game did she like the best. Pokemon Blue-Red style. Unfortunately, I failed at the style, fortunately, it looks good anyway. This is really cool all right. I like the way you pixeled Lucy she looks all cute and happy because shes going to crush mike. They look really cool, you did a excellent job on them. 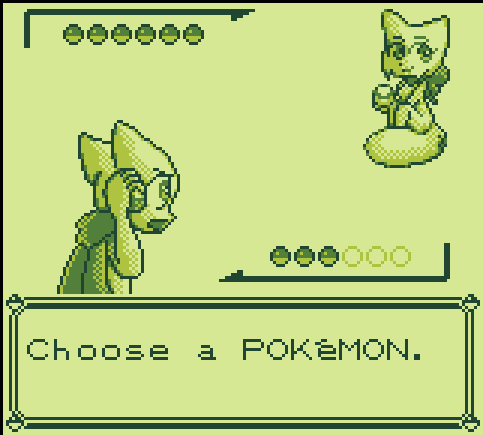 Makes me want to see a BCB sprite hack for Pokemon Red, Blue, Green and Yellow.